Metropolis wasn’t a bad place, but it wasn’t a good one either. 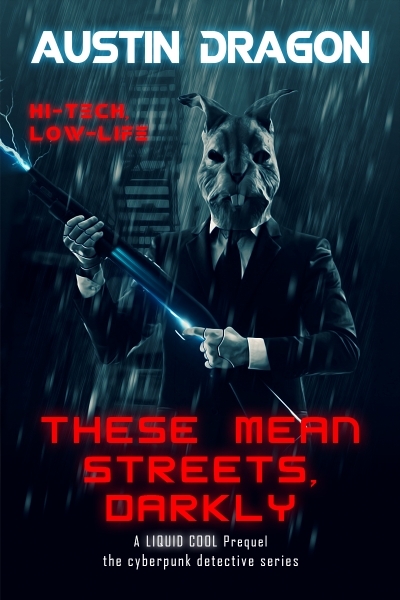 THESE MEAN STREETS, DARKLY is the prequel to the cyberpunk, detective series, LIQUID COOL. It’s a world of colossal skyscrapers. Hover-cars fly above in the dark, rainy skies and gray people walk below on the grimy, hard streets in this “neon jungle.” Uber-governments and mega-corporations fight for control of the super-city, but so does crime. A girl is kidnapped by the psycho Red Rabbit. Can Police Central find the girl in time—alive? Is it really a random, senseless kidnapping in the fifty-million-plus city? There are a million victims and perpetrators in this high-tech, low-life world. This is one of those stories…before we meet our private eye (and unlikely hero) of Liquid Cool!